In September of 2015 the Academy of Natural Sciences of Drexel University (ANS) had the opportunity to host a panel on climate change keynoted by economist and economic development expert Jeffrey Sachs. As part of his talk, Prof. Sachs discussed the pending passage of the UN Sustainable Development Goals (SDGs). His description of the SDGs provided an inspiring element of hope in what is sometimes a depressing conversation. World social, economic, and environmental problems are vast, particularly when discussing climate change, but the idea of concerted effort by the world community to squarely face these problems—and set goals to address them—offers movement in the right direction. At ANS we’re not formally working on SDGs, but the spirit of the goals is part of our institutional DNA. As one of the oldest natural history institutions in the western hemisphere, we are committed to high-level research and to scientific excellence. But we are also guided by two other key principles—active public engagement and positive human impact. Science is the centerpiece of our work, but our explicit goals include communicating, translating, and acting on science in ways that benefit humanity. For the last 70 years, an important part of that science has been research and action to understand and protect streams, rivers, and watersheds. Water quality starts in nature, and we work to make sure that the ecology of waterways is doing its part to keep water clean. It’s obvious that Goal 6—ensuring “availability and sustainable management of water and sanitation for all”—resonates deeply with our advancing research, education, and public engagement in biodiversity and environmental science. In Philadelphia, the front door of our city is the Delaware River. Though the Delaware Basin is smaller in area than the Chesapeake or the Great Lakes, the river provides drinking water for 15 million people—5% of the U.S. population. Thirty years after the passage of the Clean Water Act, many of the nation’s streams and rivers remain impaired. While the CWA has been very successful in controlling industrial and wastewater discharges it has revealed a different and more insidious stress—“nonpoint source pollution.” Runoff across the landscape, from farms, lawns, city streets, and urban gutters, can carry as much pollution as a sewage plant, and it has proven much more difficult to control. The Delaware is no exception. The 13,500-square-mile watershed of the Delaware is a mix of undisturbed woodlands, highly developed metropolitan areas, and large tracts of farmland. Limiting the effects of runoff on the Delaware is crucial for both society and nature. For the last five years, ANS has been one of the lead partners in the Delaware River Watershed Initiative (DRWI). This is a multi-year, multi-dimensional, multi-million-dollar effort launched by the William Penn Foundation to protect and restore the watersheds of the Delaware. In the last three years, William Penn has invested upwards of 40 million dollars in the work of over 50 partner organizations involved in a wide range of projects to protect the valuable forested headwaters and restore the sections of the basin that have been impaired by urban and agricultural runoff. As the restoration and protection projects are planned and carried out, the Academy has had the opportunity to ensure the presence of sound science in all aspects of the DRWI. 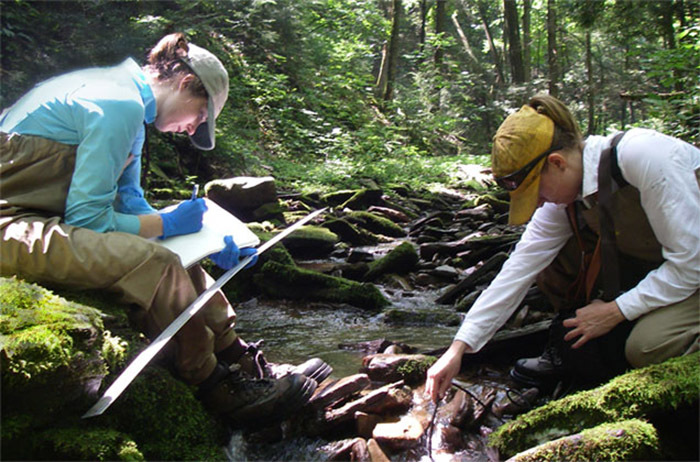 From identifying priority sites to monitoring the ecological results of the projects, the DRWI has provided a unique example of how science and community organizations can work together. The DRWI is just one example of work by ANS that aligns with the SDGs. Through education, research, and public programs, ANS has been involved in issues identified as critical for people and the planet. The DRWI has provided a unique and unprecedented level of involvement for ANS, both in terms of working with practitioners and in the breadth and scale of the activity. We think this is a cutting-edge trend that will become an expected role for science in the future as we deal with complex problems in human and natural systems. From biodiversity and water quality to the overarching issue of climate change, ANS is working to engage the public around scientific questions and apply them to positive human impact. The SDGs will provide a context for future work in many of these areas.